“Men and women should not have to choose between a family and a career. 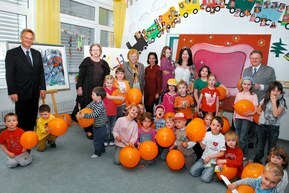 And they should not feel that their children are not well looked after while they are working”, declared Siegbert Lapp, Chairman of the Supervisory Board of LAPP Holding AG as he explained why LAPP was supporting the construction of high-quality childcare facilities in the Stuttgart region. Those searching for evidence of our commitment to this issue need look no further than the charity Kind e.V. Stuttgart, which LAPP founded together with other companies in 1992. Siegbert Lapp served as the charity’s first chairman until 2013, before handing over the position to Jochen Sanguinette, Managing Director of Trelleborg Sealing Solutions Germany GmbH. The charity supports the construction of childcare facilities near workplaces. It has experienced great success, helping several construction projects over the years. These centres solve a problem for companies and communities, flexibly adapting their childcare provision to the needs of businesses and parents. Siegbert Lapp believes this support pays for itself many times over. As well as parents and children, it also helps companies. This is because good childcare allows them to get the most from their highly qualified staff and become a more attractive employer to young skilled workers.